Connect a DVI Display to a Mini DisplayPort Video Source. 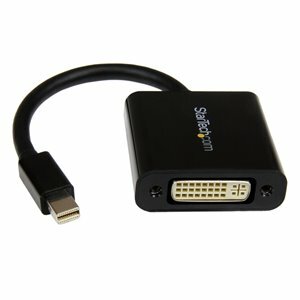 The MDP2DVI3 Mini DisplayPort to DVI Adapter lets you connect your Mini DisplayPort video source (such as any of your MacBook or Microsoft Surface Pro devices with mDP) to a DVI monitor, projector, or display, eliminating the expense of having to upgrade to a Mini DisplayPort-capable monitor.Compatible with Intel Thunderbolt, when connected directly to a supporting DisplayPort over Thunderbolt I/O port, the adapter supports display or projector resolutions up to 1920x1200 (WUXGA) and is compliant with HDCP standards.MDP2DVI3 is a passive adapter that requires a DP++ port (DisplayPort++), meaning that DVI and HDMI signals can also be passed through the port. The MDP2DVI3 Mini DisplayPort to DVI Adapter lets you connect your Mini DisplayPort video source (desktop PC, laptop, etc.) to a DVI monitor, projector, or display, eliminating the expense of having to upgrade to a Mini DisplayPort-capable monitor.Compatible with Intel Thunderbolt, when connected directly to a supporting DisplayPort over Thunderbolt I/O port, the adapter supports display or projector resolutions up to 1920x1200 (WUXGA) and is compliant with HDCP standards.MDP2DVI3 is a passive adapter that requires a DP++ port (DisplayPort++), meaning that DVI and HDMI signals can also be passed through the port. Backed by a StarTech.com 2-year warranty and free lifetime technical support.